The Renoir Restaurant on the Carnival Conquest, located mid ship on Lobby Deck 3, includes optimum balcony seating. 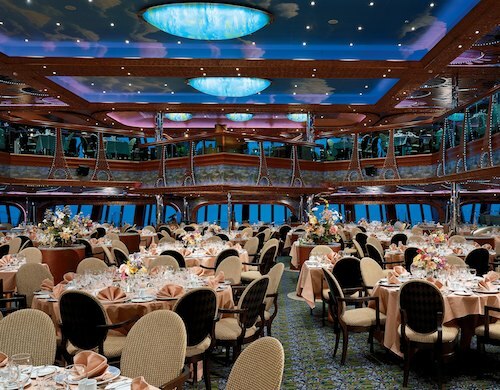 This Carnival Conquest main dining room is delightful to the eye. Hand painted soft blue interior walls, Eiffel Tower grille work, and a sky ceiling replete with clouds complete an atmosphere worthy of this restaurant's namesake. Chicken, seafood, and beef entrees, as well as international features from Asia, Italy, and India are available, and lobster is typically served one evening on most cruises. Your meal includes choices from among three to four appetizers, two soups and salads, and a selection of desserts in addition to cheese and ice cream. The Renoir is open for Your Time and Traditional dining. On port days, there is open seating in the Renoir for breakfast. Brunch is served in the Renoir on Sea Days. Like her sister, the Monet Restaurant on the Carnival Conquest is carefully appointed in soft, French Impressionist décor. The Monet Restaurant, also a main dining room, is located on Lobby Deck, and offers balcony dining, too. Menu fare is identical to the Renoir Restaurant, however the Monet is aft of the ship, and its windows provide lovely views. The Monet is open for traditional dining only. Early dining is 6:00pm and 8:15pm. Send us your review of the Carnival Conquest's Main Dining Rooms! We need your thoughts on what you liked about the restaurant, and, what you think could be improved. Use the form at the bottom of this page to let us know your impressions. Guests have indicated that service can be slow, especially when seated above the first floor. Your Time dining occurs from 5:45pm to 9:00pm in the Deck 3 level of the Renoir. Breakfast is served from 7:30am to 9:30am on port days, and there is an open seating brunch from 8:30am to 1:00pm on Sea Days. These are served in the Renoir. For breakfast and lunch, casual clothing is OK, but no swim wear is permitted. Read the Fun Times regarding appropriate attire for dinner. Meals are no cost, but special beverages, wines, beer, and soft drinks may be purchased via current bar menu. When ordering steaks, make sure you state your preferences as the kitchen staff tend to over-cook meat. While there is no smoking in either dining room, guests have complained of smoke en route to these dining areas via casinos. Seating in the balcony areas is preferable for most because it is more quiet than the main floor. The Renoir is usually less crowded than the Restaurant Cezanne lido buffet for breakfast and lunch. While both main dining rooms of the Carnival Conquest offer meals most guests recommend, The Point Supper Club is considered to be the dining highlight of the cruise and we highly suggest you plan at least one evening to include this experience. Throughout your Carnival Conquest cruise, you'll be able to savor cuisine as you wish on your time! From 5:45pm to 9:30pm, both main dining rooms provide first come, first serve seating. Wait time is usually 20 minutes, and parties of ten plus may be accommodated at different tables. All tips for the Monet and Renoir do apply. Check out our article on Carnival Cruises Your Time Dining for additional information. A sample dinner menu for the Monet and Renoir Restaurants is available at our Carnival Cruise Menu guide. Information about the Restaurant Cezanne on board the Carnival Conquest. Information about Carnival Conquest's The Point Supper Club.